Key difference: The Samsung Galaxy Note 8.0 aims at filling the gap between the Galaxy Note II and the Galaxy Note 10.1. The Galaxy Note 8 features an 8 inch TFT capacitive touchscreen with a resolution of 800 x 1280 pixels. The device is powered by a Quad-core 1.6 GHz Cortex-A9 and 2 GB of RAM. The device runs on Android OS, v4.1.2 (Jelly Bean). The Samsung Galaxy Mega 6.3 is named such because of its 6.3 inch TFT capacitive touchscreen with a resolution of 720 x 1280 pixels. The phone is powered by a Dual-core 1.7 GHz Cortex-A15 processor with a 1.5 GB RAM. Samsung is a major player on the world smartphone platform. It is the second most popular smartphone retailer in the world by number of units sold, after Apple. It is in fact the first most popular Android smartphone retailer in the world by number of units sold. The company’s Samsung Galaxy S3 was the first phone that gave the iPhone a real competition. Hence, effectively making the Galaxy brand, a brand to be reckoned with. 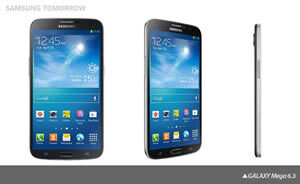 Another line of products that Samsung has made popular is the ‘phablet’ by introducing the Samsung Galaxy Note. A phablet is a cross between a phone and a tablet; it sized as a table but with all the properties of a phone. Samsung’s latest product in this category is the Samsung Galaxy Note 8.0. While, officially the Note 8 is considered a tablet, it does come with the optional SIM slot, thus allowing it calling and 3G capabilities. 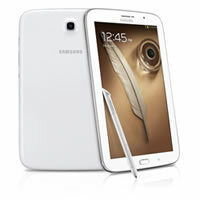 The Samsung Galaxy Note 8.0 aims at filling the gap between the Galaxy Note II and the Galaxy Note 10.1. The Galaxy Note II featured a 5.55 inch screen, while the Galaxy Note 10.1, as the name suggests a 10.1 inch screen. There just wasn’t an option in between unless one considered the Galaxy Tab series, which of course did not come with the S-pen stylus. The Galaxy Note 8 features an 8 inch TFT capacitive touchscreen with a resolution of 800 x 1280 pixels. The device is powered by a Quad-core 1.6 GHz Cortex-A9 and 2 GB of RAM. The device runs on Android OS, v4.1.2 (Jelly Bean). It is available with or without the support for a SIM and in 16 GB or 32 GB variants. In addition of the 16GB or 32 GB internal storage, the device hosts an external storage capacity of up to 64 GB. The device features a 5 MP primary camera with a 1.3 MP secondary primary camera. In addition to the above mentioned features, the phone also boasts several features that are available on the Samsung Galaxy S4. This includes ‘Samsung WatchON’ that transforms the phone into an IR remote controller to connect to the home entertainment system; as well as ChatON, which allows the user to share the phone’s screen with other users. In addition the device also has a split screen capability that allows two or more applications to share the screen. These applications include email, messages, ‘MyFiles,’ ‘S Memo,’ ‘S Planner’, and more. The phone also has the popular ‘Air View’ feature, which allows users to preview information in emails, photos in Gallery, and speed dial contacts, before opening them. The Samsung Galaxy Mega 6.3 is named such because of its 6.3 inch TFT capacitive touchscreen with a resolution of 720 x 1280 pixels. The phone is powered by a Dual-core 1.7 GHz Cortex-A15 processor with a 1.5 GB RAM. The phone runs Android 4.2.2, the latest version of Android at the time of its launch. The phone also features an 8 MP primary camera and a 1.9 MP secondary front-facing camera. In addition to the above mentioned features, the phone also boasts several features that are available on the Samsung Galaxy S4. This includes ‘Group Play’, which enables easy content sharing for up to 8 devices on the same Wi-Fi network; ‘Samsung WatchON’ that transforms the phone into an IR remote controller to connect to the home entertainment system; ‘Samsung Link’ for streaming photos, videos, notes, or music to the television, tablet or computer; ‘S Translator’ that provides instant translation, using text or voice translation on applications including email, and ChatON, which allows the user to share the phone’s screen with other users. Furthermore, the phone also has a split screen capability that allows two or more applications to share the screen. These applications include email, messages, ‘MyFiles,’ ‘S Memo,’ ‘S Planner’, and more. The phone also has the popular ‘Air View’ feature, which allows users to preview information in emails, photos in Gallery, and speed dial contacts, before opening them. In addition, the ‘S Travel’ feature trip information, local guides and resources, etc., while the ‘Story album’ allows users to create albums of daily events, keep special moments in one place using a timeline, geo-tag information and publish digital albums in hard copy. The information for the detailed table about the two phones has been taken from the Samsung websit, samsungmobilepress.com, samsungtomorrow.com, gdgt.com and GSMarena.com.